MILAN (AP) Napoli appears more and more likely to end Juventus’ stranglehold on the Italian league title. Serie A resumed on Sunday after a winter break and Maurizio Sarri’s team won 1-0 at Atalanta to extend its lead at the top of the Serie A standings to four points ahead of Juventus. The six-time defending champion hosts Genoa on Monday. It appears to be turning into a two-horse race after Inter Milan could only draw 1-1 at home to fifth-placed Roma and slipped to fourth. Lazio beat Chievo Verona 5-1 to move third, but is 11 points behind Napoli, albeit with a match in hand. Napoli had lost three of its last four matches against Atalanta but Dries Mertens ended his goal drought in timely fashion to help his team break that hoodoo. Napoli won its only two Italian league titles in 1987 and 1990 with Argentine great Diego Maradona leading the way. 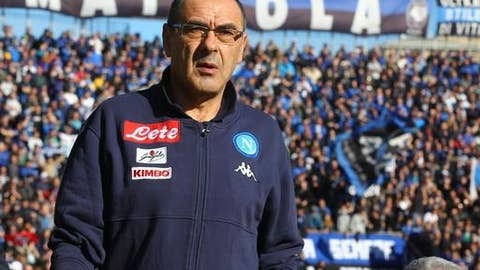 Napoli was looking for revenge after losing the Italian quarterfinal to Atalanta at the beginning of the year but struggled to create anything against a very well-organized defense. The visitors broke the deadlock in the 65th minute as Mertens beat the offside trap to run onto Jose Callejon’s through-ball and smash it in for his 11th league goal this season but his first in 10 Serie A matches. Atalanta had chances to level, while Napoli substitute Marek Hamsik blazed over the bar from a good position. Hamsik also had a goal ruled out for offside in stoppage time. Inter’s difficult period continued with a 1-1 draw against Roma as it remained winless in Serie A since a 5-0 victory over Chievo on Dec. 3. Only Matias Vecino’s header four minutes from time prevented Inter from falling to a fourth defeat in its last six matches in all competitions. ”We couldn’t lose this game, we gave it everything, in the second half we pinned Roma back and we deserved the draw,” Vecino said. ”We couldn’t continue not getting points … we have to get back to winning but our reaction was good today. Stephan El Shaarawy had fired Roma in front in the 31st, dinking the ball over onrushing Samir Handanovic after a long clearance from visiting goalkeeper Alisson. Inter laid siege to the Roma goal in the closing stages and Alisson pulled off a number of great saves, including tipping Mauro Icardi’s shot onto the left post. The Brazil goalkeeper also managed to keep out another effort from the Inter captain from point-blank range. Lazio could be left counting the cost of its impressive 5-1 victory over Chievo as it lost Serie A top goalscorer Ciro Immobile to injury. Immobile, who has scored 20 goals in the league this season, pulled up in the 34th minute clutching his thigh and immediately asked to be replaced. He will undergo tests but coach Simone Inzaghi said it did not appear to be serious. Sergej Milinkovic-Savic had put Lazio 2-1 up minutes earlier. Luis Alberto opened the scoring for Lazio but a defensive lapse allowed Manuel Pucciarelli to level less than a minute later. Chievo thought it had a chance to equalize in first-half stoppages as it was awarded a penalty after Senad Lulic appeared to trip Mariusz Stepinski but the referee changed his mind on video review. Milinkovic-Savic doubled his tally in the 68th, and Juan Bastos and Nani extended Lazio’s lead late on. Franck Kessie scored two goals, including a penalty, as AC Milan came back to win 2-1 at Cagliari in windy conditions. Both teams ended the game with 10 men as Milan defender Ricardo Rodriguez was sent off following a second yellow card late on, as was Cagliari goalscorer Nicolo Barella eight minutes later. Milan moved seventh, two points behind Sampdoria which beat Fiorentina 3-1, with Fabio Quagliarella scoring a hat trick against his former club. Elsewhere, Crotone moved out of the bottom three as it won 3-0 at 10-man Hellas Verona in a relegation fight. Crotone moved two points above Spal which drew 1-1 at Udinese. Bottom-side Benevento lost 3-0 at Bologna while Sassuolo drew 1-1 against Torino.